One of the things I love most when Emmett works from home is being able to enjoy a delicious lunch together. With a glass of wine. Out on the porch. Listening to the birds. 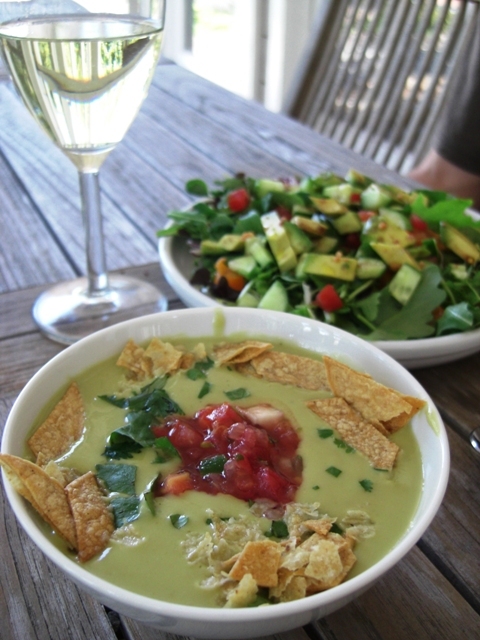 Today, we had leftover Crema de Guacamole soup (from Heidi Swanson's Super Natural Cooking) and a fresh salad with mixed greens, tomatoes, cucumbers, avocado, and sprouts topped with genmaicha salt (from Saltistry) and drizzled with olive oil and balsamic vinegar. All served up alongside a Fume Blanc from Castoro Cellars in Paso Robles. A workday afternoon doesn't get any better than this.